This collection of twelve three-dimensional puzzles was created by Peter Stocken to exhibit the development of his cutting from 1974 through to 1990. All the puzzles are extremely difficult to assemble. Many of the woods used in the puzzles are no longer obtainable. 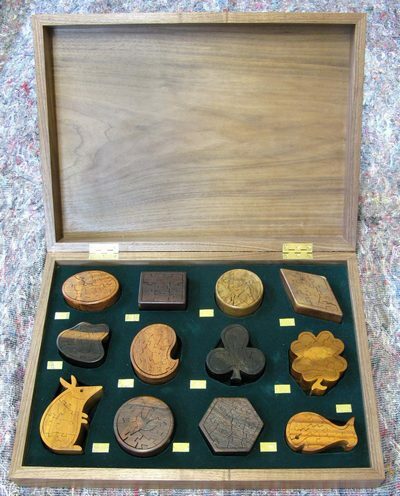 The earliest puzzle in the collection was made the year he devised his individual design of puzzle and, compared to his later puzzles, was very primitive: at most three layers deep and the bottom was made from a different piece of wood. 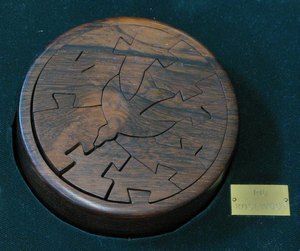 The penultimate one in the collection, the Round in ‘Rio’, has by contrast his characteristic four layers together with a Swallow on the top surface, ‘S’ on the bottom and a ‘P’ hidden deep within the puzzle. These are two of his initials; the ‘50’ in the Palisander Hexagon he finished on his 50th birthday. The exquisite display box was made in May 2015 by that master cabinet-maker, Chris Tribe. 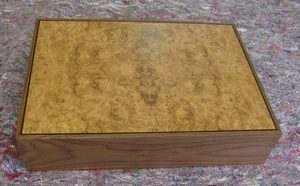 The body of the box is English Walnut with panels of Burr Oak on the top surface surrounded by a thin frame of Indian Ebony. The price of the presentation box of puzzles is £1750. In the list of puzzles below, the letter and number in square brackets is Peter’s signature inscribed on the base of every puzzle. He only started signing them in August 1979 when he was commissioned by Stephen Sondheim to make a ‘Cello puzzle in Indian Ebony, for him to give to Leonard Bernstein: that was – naturally – [A1].